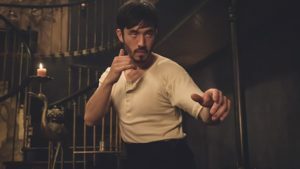 Based on the writings of Bruce Lee, crime drama series, Warrior, will premiere on Cinemax on April 5. Filmed in Cape Town, South Africa, Warrior is created and executive produced by Jonathan Tropper (Banshee) under Tropper Ink Productions. Justin Lin and Danielle Woodrow will executive produce on behalf of Perfect Storm Entertainment, and Shannon Lee will executive produce for Bruce Lee Entertainment. Its first season will comprise of ten episodes, according to a report by ComingSoon.Net. The period drama is a rare and much-welcomed opportunity to show Asian characters in a period drama not set in Asia. “Warrior is a gritty, action-packed crime drama set during the brutal Tong Wars of San Francisco’s Chinatown in the second half of the 19th century. The series follows Ah Sahm, a martial arts prodigy who emigrates from China to San Francisco under mysterious circumstances and becomes a hatchet man for one of Chinatown’s most powerful tongs (Chinese organized crime family). Don’t miss Warrior on April 5 on Cinemax.